When you think of Los Angeles, one image that comes to mind is that of the beach. 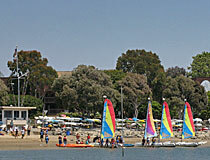 Since many visitors come here from areas that are nowhere near the ocean, the beach is a popular tourist attraction. In addition to typical beach activities - such as volleyball, swimming, tanning, skating and bicycle riding - many people enjoy simply sightseeing at the beach. As you're walking along the coast or on a pier you can smell the salt air, feel the ocean breeze, listen to the waves crash into the sand and hear the seagulls cry overhead. In addition, no image or movie can capture the immensity of the ocean that you feel when you're standing next to it. That's why many people want to visit the beach while on an extended layover at Los Angeles International Airport (LAX). The problem is that there are no beaches within easy access of LAX. This might be puzzling, because if you look on a map, LAX is right next to the ocean. Indeed, departing aircraft are over the ocean within a minute of takeoff. You can get to the beach from LAX using public transportation. However you might be surprised to find out that the closest beaches are not the fastest to get to. The most important consideration on selecting a beach is the number of transfers you'll need to make in order to get there. 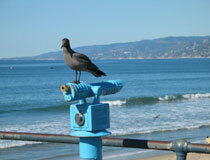 For that reason, the easiest beaches to visit are Santa Monica, Hermosa Beach and Marina del Rey. Of the three, Santa Monica has the most tourist attractions. Marina del Rey offers the shortest bus ride. Hermosa Beach has more restaurants and bars than Marina del Rey, and it's within reasonable distance. 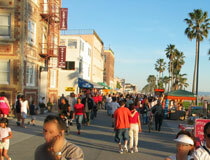 Venice Beach is also a popular destination, simply because it's known world-wide. Venice Beach is fun in a campy "Hollywood" sort of way. 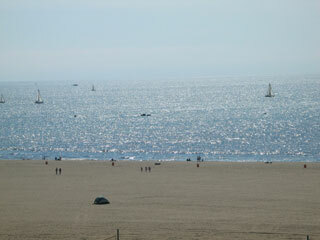 If you have to choose just one beach to visit, LAtourist.com's suggestion is Santa Monica. Hermosa Beach Pier (Commute: 30-60 minutes each way) - Features beach activities such as Surfboarding, skateboarding or boogey boarding, bicycle riding, etc. There are also many restaurants and clubs in the area. 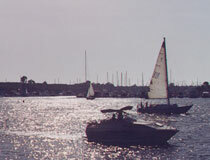 Marina del Rey (Commute: 15-30 minutes each way) - Closest beach to LAX. Rental shops, sightseeing, skating, biking, shopping and beach activities. Venice Beach is close enough for a side trip if you have extra time. Redondo Beach Pier (Commute: 30-60 minutes each way) - Features restaurants and bars, gift shops, ocean views and more. 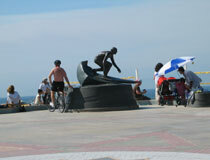 It is a large pier where you can walk around, people watch or browse stores. There are a few eateries where you can buy fresh seafood and have it prepared for you. Santa Monica (Commute: 30-60 minutes each way) - Features an outdoor shopping district, street performers, a shopping mall, restaurants, a small amusement park, views of the Pacific Ocean. If you want to do something near the beach, this is your best choice. Although other beaches are closer to LAX, there is a "rapid" bus that goes to Santa Monica with a minimum number of stops. Venice Beach is close enough for a side trip if you have extra time. Venice Beach (Commute: 60-90 minutes each way) - Features street performers, gift shops, restaurants, snack stands, ocean views, Muscle Beach workout area, people-watching, and more. Venice beach is closer to LAX than Santa Monica, but requires an extra transfer, so it takes longer to get there.